When the alarm went off I had already been awake for ten minutes, I always do that when I’m excited to wake up. I slid off of the enormous bed and shuffled across the room with my arms stretched out out in front of me, searching for a wall in the pitch black room. My fingers found a wall and I dragged my hand behind me as I walked in the direction of the bathroom. I found the doorway, and then the light switch, illuminating the entire place enough for me to make my coffee. I filled the electric kettle with water and turned it on, a routine that I had begun looking forward to. I didn’t realize before traveling to New Zealand that none of the accommodations would have coffee makers, only electric kettles. I found this to be especially surprising once I was there, due to the fact that they take their coffee very seriously. Luckily I had found a french press at one of the many great coffee shops along the way, and the process of making my coffee like this was really starting to grow on me. After my morning coffee I hopped in the shower, eager to get on the road. I knew that if I missed this there would be no second chance, and I had no idea exactly when it would happen, only that it was just before dawn. I got out of the shower and fixed my hair as usual, even though I had to come back afterwards I didn’t want to waste a moment of daylight in that beautiful place, not even on myself. Once I was ready I gathered up the essentials; coffee, flashlight, my good camera, my not-so-good but waterproof camera, my cigarettes and my jacket. It was March, which means fall in New Zealand, so the air was pretty chilly at night, and on top of that it was drizzling outside. I kissed E on the cheek to say goodbye, and I left for my adventure. I never really mind when E isn’t in to doing the same things as me, I’ve always been a solitary person and I cherish any alone time that I get. I started up the car and slowly backed out of the driveway, very careful to stay on the left-hand side of the road. Luckily I only had to go about 1/4 of a mile because I was a pretty nervous driver, partly because of the left side of the road thing but also because I live in Chicago and I hardly ever drive. After my not so long drive I arrived to the parking lot to find no other cars. No way, this is awesome I thought, excited to have the whole place to myself. My excitement quickly turned to fear when I realized that I would be the only person, in the pitch black unfamiliar place, surrounded by unfamiliar sounds. 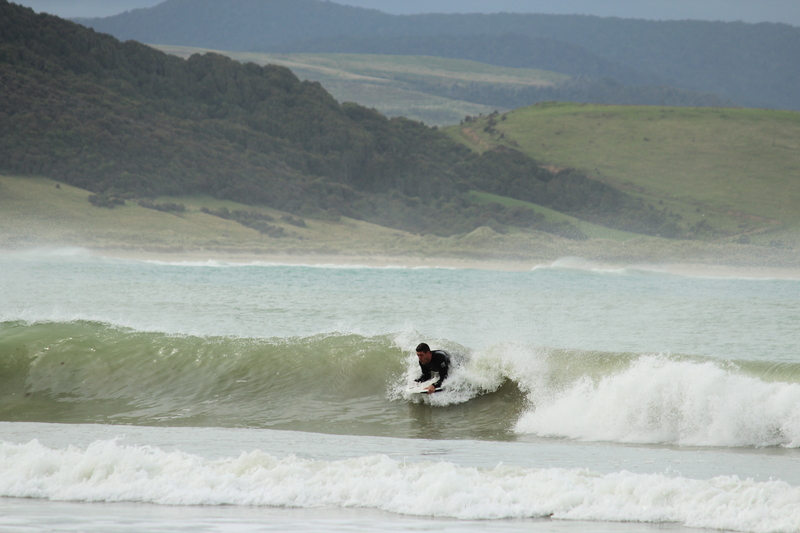 Man up, I told myself, tucking my camera into my hoodie to keep it dry, this is a once in a life time opportunity. I clicked on my little flashlight and hopped out of the rental car. To get to the ground there is a large staircase with multiple viewing areas and to get to the staircase I had to walk down a narrow path with tall plants on both sides. I couldn’t stop thinking about all of the spiders that I saw the night before and I knew that this path was literally crawling with them. I pulled the strings on my hood out as far as I could to tighten it around my face and I slowly crept forward, shining the flashlight every which way looking for a web to catch the light. Once through the path I was careful not to touch the rail of the stairs, again because of the spiders. There are only three species of spiders in New Zealand and I’m sure that they were all having a party on that staircase. As I navigated my way down the staircase I was already wishing that I had brought more coffee, it was still pitch black and I had no idea how long I was going to have to wait. Once at the bottom of the stairs I carefully made my way across the rocky terrain and over to the large flat rock that I had sat on the night before. There is a rope around the perimeter of the viewing area so that people do not disturb the penguins and this particular rock was as close as I could get without going outside of the rope. I got all of my things in order, made myself comfortable on my rock and settled in for a long wait. The air had dried up enough for me to have my nice camera out but without any light it was useless, so I turned my flashlight off to conserve the batteries and sat there among all of the things that go bump in the night. 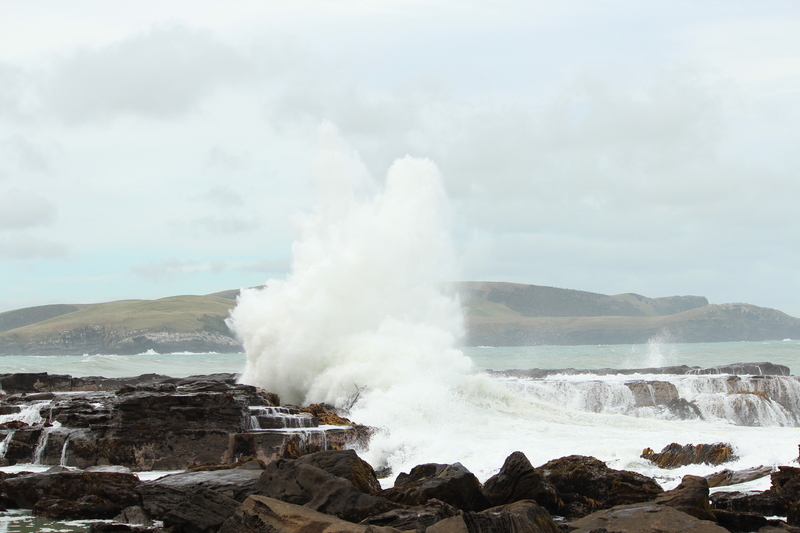 There were strange noises everywhere and the sound of the ocean crashing against the rocks made my hair stand on end; rouge waves happen all the time, I thought. All around me I could hear the rustling of what I hoped were crabs and birds. 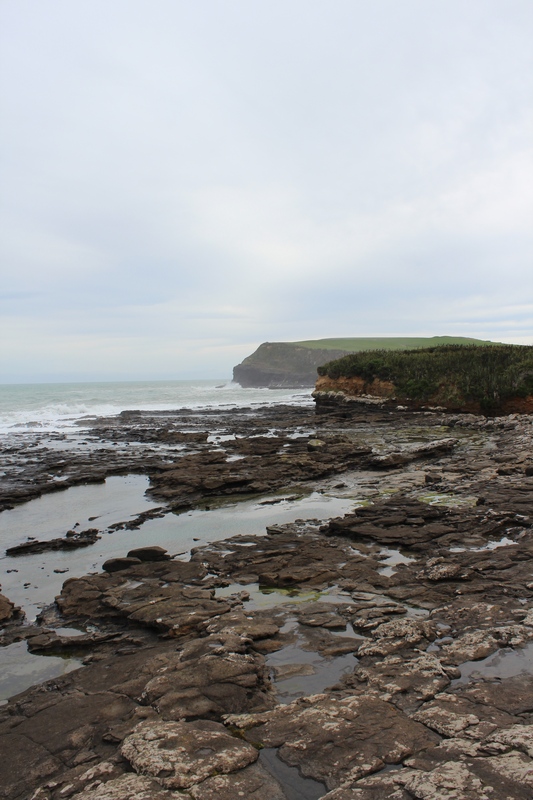 Petrified Forest, Curio Bay, New Zealand. The sun was not up yet but it was now giving off enough residual light for me to make out shadows. The birds were starting to call more, and I had no idea if this was the sound of penguins or one of the other many types of birds that came to feast on the breakfast buffet of marine life. I started to hear more and more screeching in the direction of where the penguins nest and I got my camera ready for action, the anticipation was killing me. 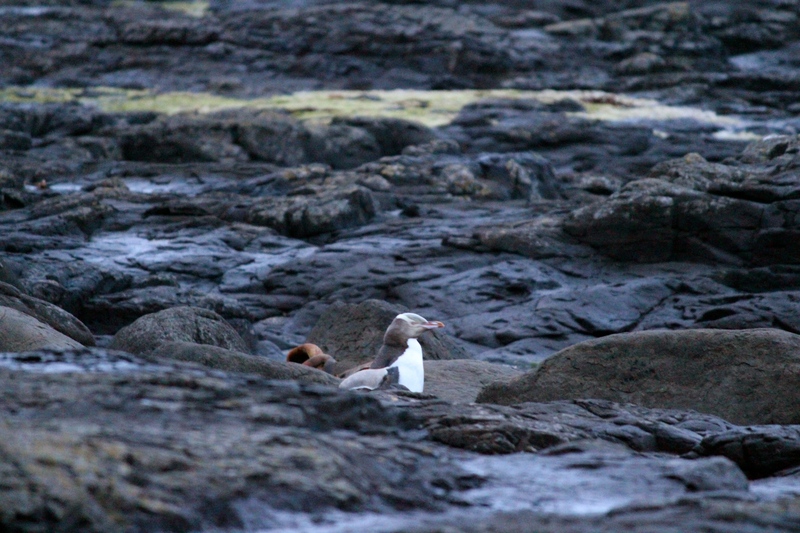 And then, after an hour and a half of waiting there it was, the elusive Yellow Eyed Penguin. He (she?) hopped out from the bushes and tilted his head up to the sky to let out a series of screeches. It was as if he was telling the entire group “It’s time to get up! 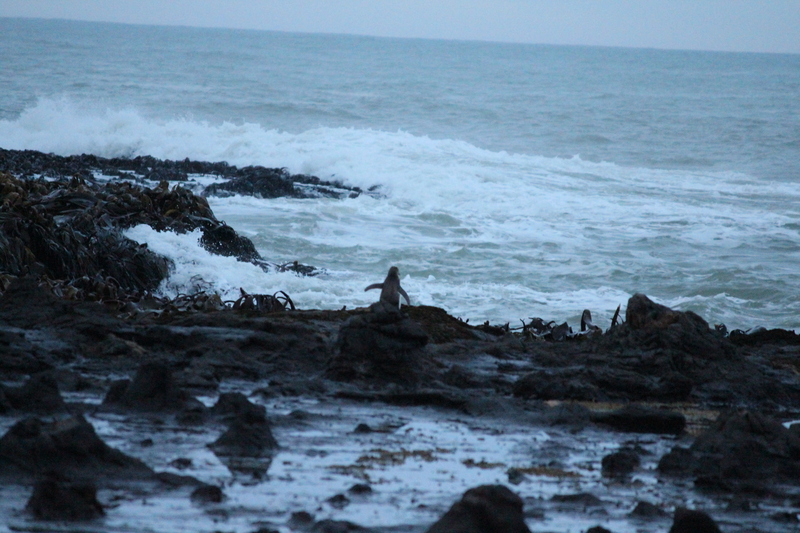 !” He hopped around the petrified obstacles, ruffling his feathers and lifting up his stubby little flippers like he was stretching out after a long sleep. Not long after he made his appearance another little guy popped out, and another, and another! 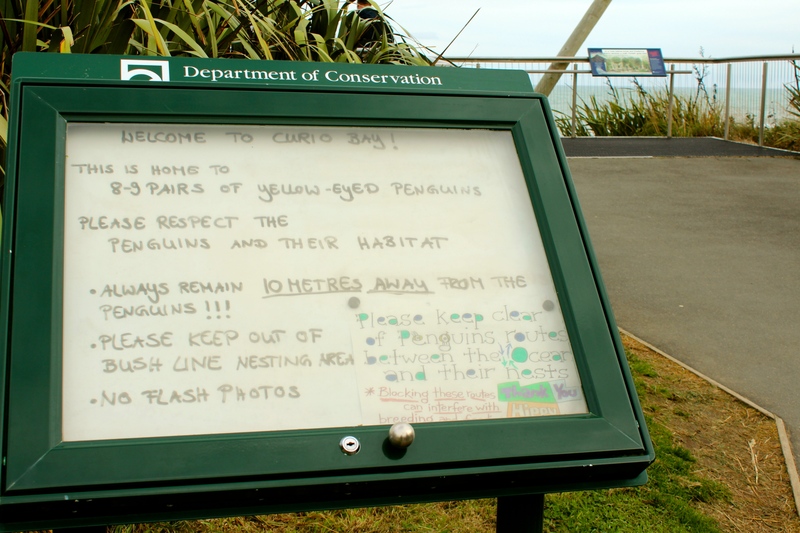 About six penguins in total, all at different times, emerged from their nesting spots hidden in the bushes and stretched out their flippers in preparation for the day. Most of the other penguins made their way down to the ocean right away, hopping into the water one by one as I had seen them do so many times on The Discover Channel. 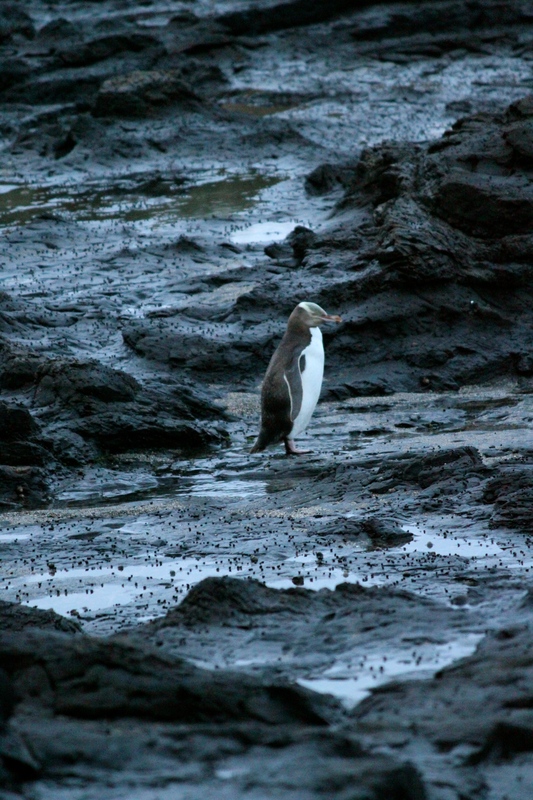 But the first penguin, my little guy, seemed to be sticking around just for me. He was still stretching out, taking his time waddling down to the water, stopping frequently to ruffle his feathers and drink out of the puddles of rainwater that had accumulated between the rocks. After about thirty minutes of showing off, my penguin started to make his way for the ocean. He held his flippers out as he hopped across the uneven terrain, like a tightrope walker putting their arms out for balance. 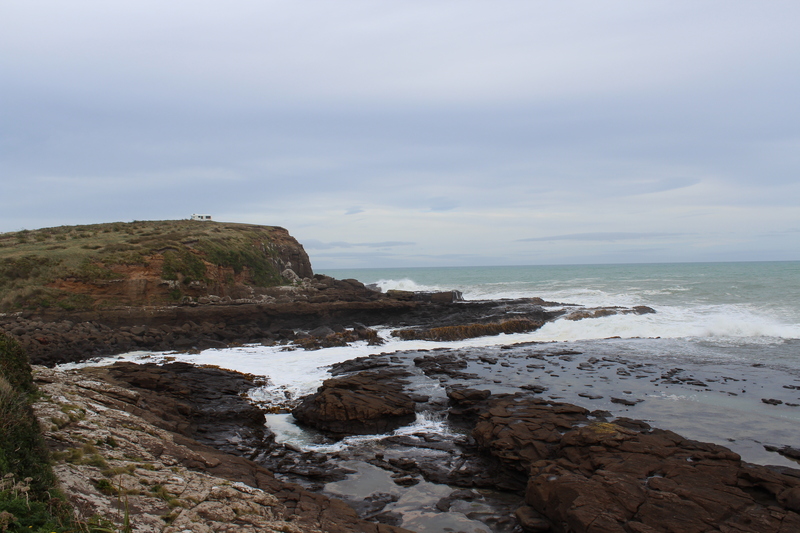 Once he got to the edge of the rocks, where the ocean was spilling up and over the headland, he paused; looking right and left as if checking for traffic, and then he was gone. 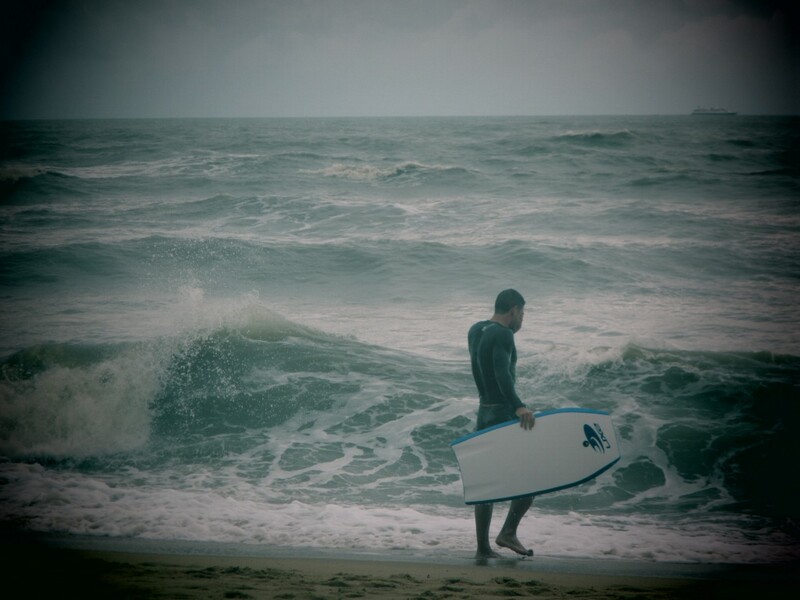 He disappearing into the ocean as if he was never there. 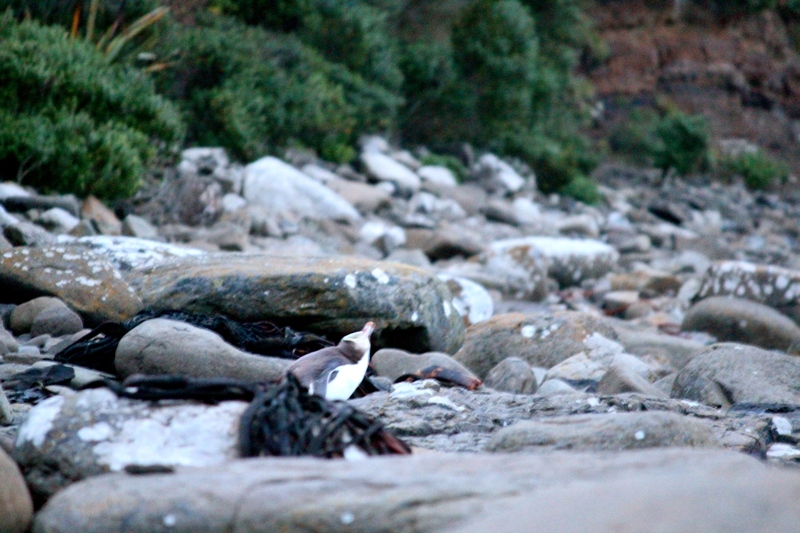 The only time to spot the Yellow Eyed Penguins in Curio Bay is at dusk when they come in from the water and at dawn, when they go back out. 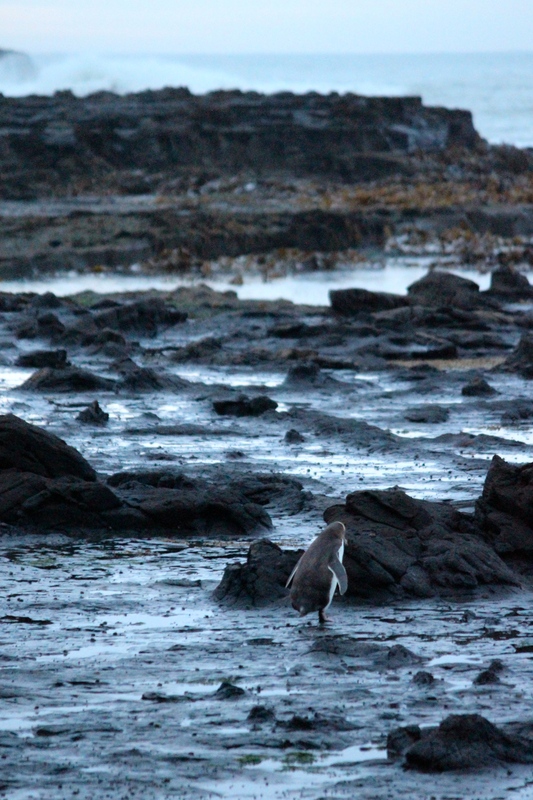 We did try spotting them the night before but we only got to see one penguin from very far away, not to mention there were about twenty-five other people there. I highly recommend going early in the morning for a better chance at spotting them and having the whole place to yourself. 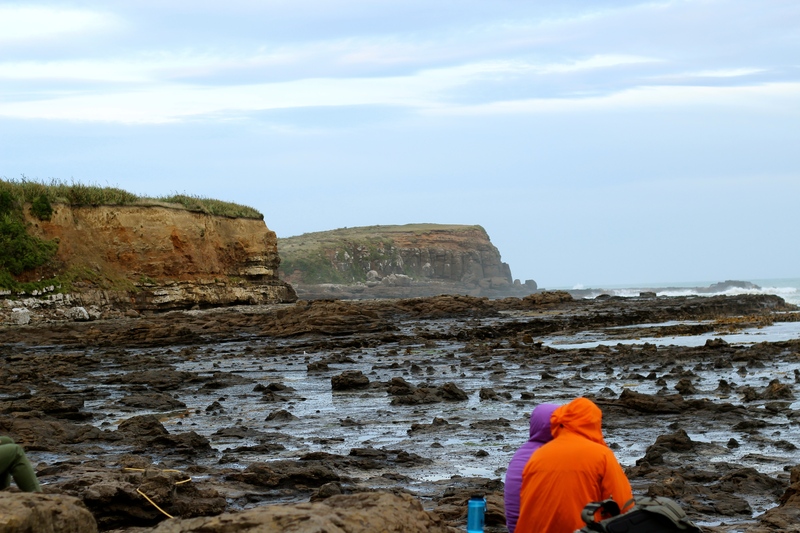 The reason that I chose to stay in Curio Bay for a night is because of all of the amazing and rare things that can be found in this one tiny part of the world . The rough terrain that I was sitting on is actually a 180 million year old petrified forest and the “rocks” are actually petrified tree stumps that were once covered in lava. The yellow-eyed penguins are the rarest species of penguin in the world with only 5000 of them still in existence. 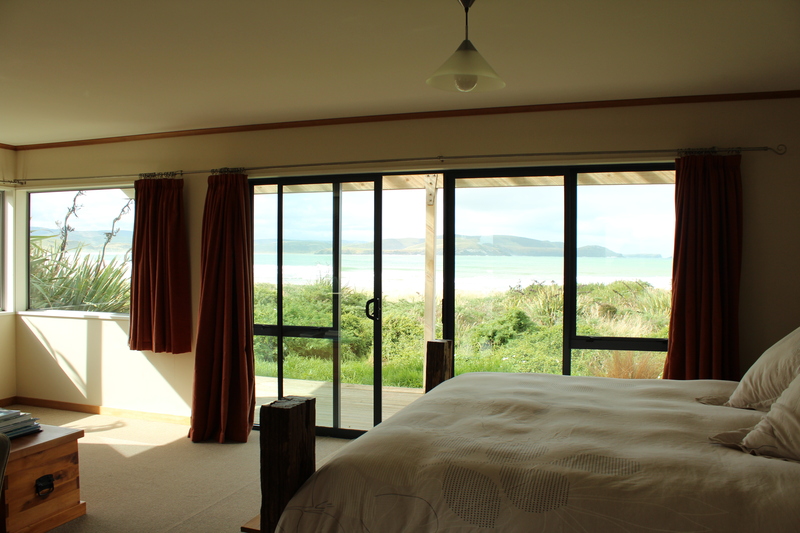 *¹ The bay itself is home to the Hector’s Dolphin, the most rare, and one of the smallest of the dolphin species. 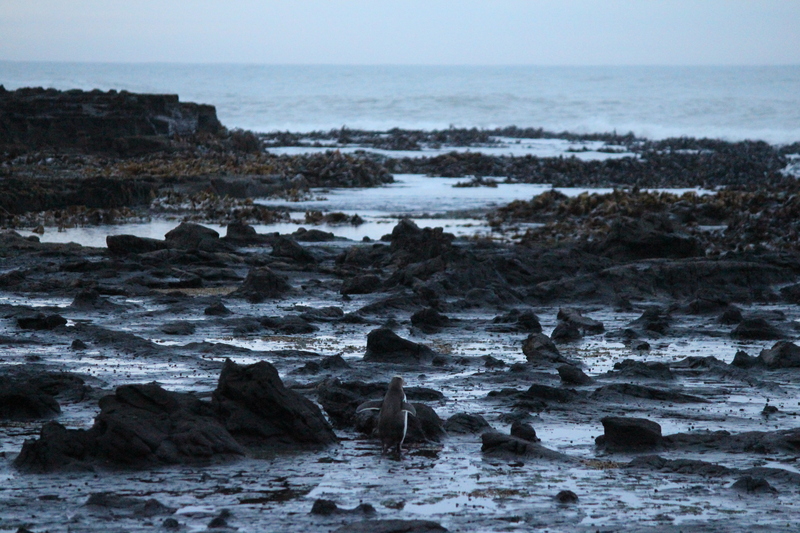 Fur seals and sea lions can often be found basking in the sun on the beach or the rocks. *² Unfortunately we did not get to see any dolphins, seals or sea lions, a storm had come through the night before and taken all of the usually plentiful fish in the bay back out to sea with it. 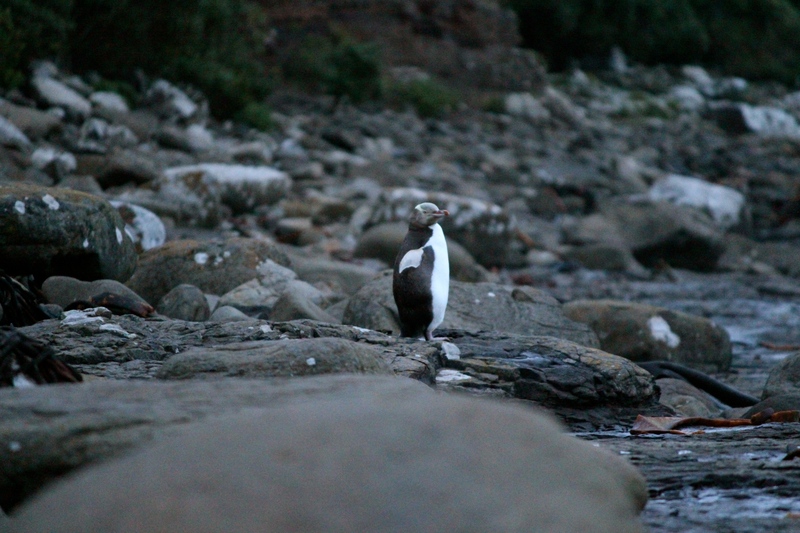 I’m not complaining though, because I know how lucky I am to be one of the few people in the world to get to wake up with the Yellow Eyed Penguins. 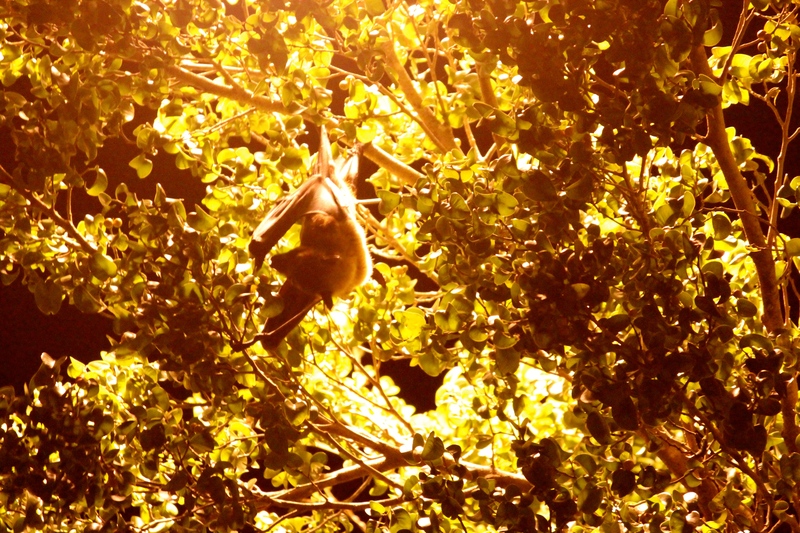 Getting to see these rare creatures in the wild was one of the most special things that I have ever experienced. That morning was surreal to say the least, and I feel humbled and blessed to have gotten to have it all to myself. I can only hope that these amazing birds will grow in numbers and be around for generations to come. No. We Can’t Stop Here, This is Bat Country. 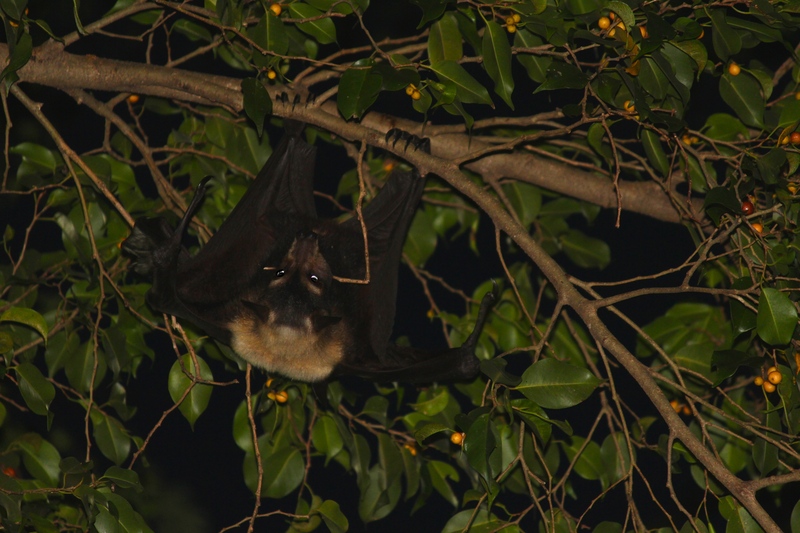 Earlier this year, while in Queensland, Australia, I was lucky enough to come across one of the coolest creatures that I’ve ever seen first hand, the flying fox, aka fruit bat. We were strolling down the main strip in Airlie Beach one evening at sunset, full from dinner and still foggy from the night before, when a large cat on a hang-glider flew right over our heads. “What the hell? !” we ducked and swatted at the air like we were being attacked by killer bees. 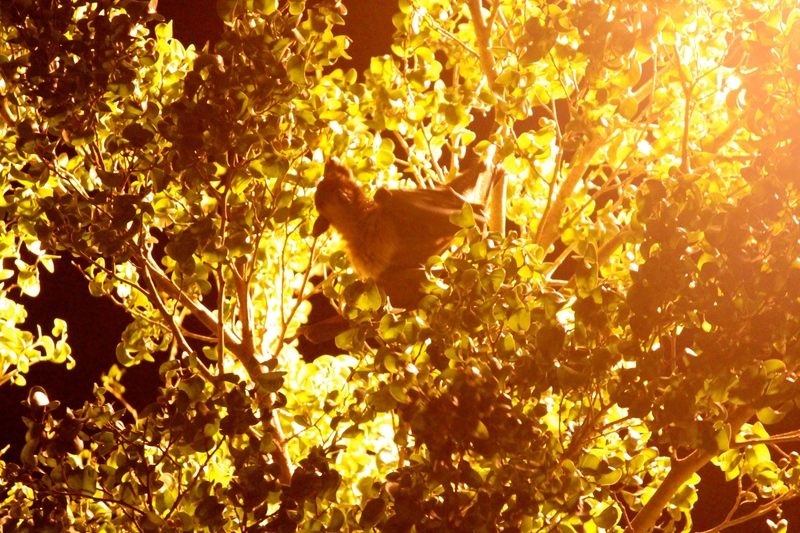 It didn’t take me long to realize that I was in bat country, fruit bat country. 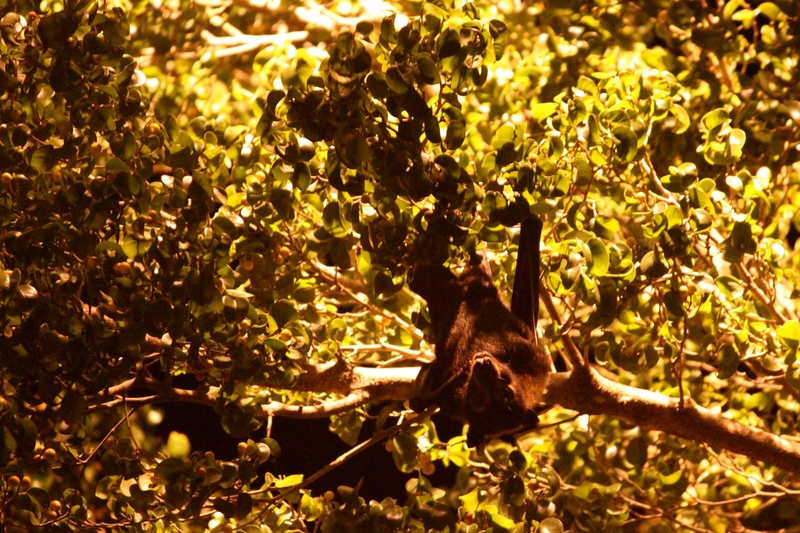 I only saw one fruit bat while in Airlie Beach but the closer we got to Cairns the more we saw. 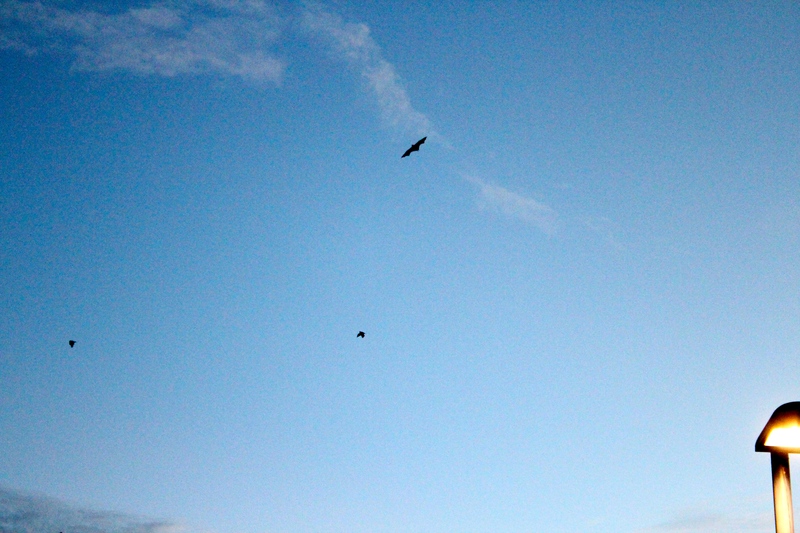 They would come in flocks at dusk and if you didn’t look closely enough you might just think that they were crows. You could hear them crashing into the trees as they landed and sometimes falling from the top to the middle until they found a branch to cling to. Where there was one, there were many. You could hear them screeching and ticking, unclear whether they were having a conversation or warning each other to back up off my fruit yo. Sadly, I am not a photographer, and though I became slightly obsessed with trying to capture these guys on film, my efforts were futile. The light (or lack thereof), and movement made it nearly impossible for a novice like me to get a shot. So out of hundreds, I have only a few usable images, and even those are mediocre at best. Apologies for the lousy photos and HAPPY BAT WEEK! !